Canada is the second-largest country in the world. With a population of about 34 million people, the country occupies the northernmost parts of North America and spans from the Atlantic to the Pacific Ocean. The climate ranges from temperate and continental to arctic, with landscape in the southern parts dominated by pine woods as well as lush grain fields. To the north lie expanses of tundra and frozen arctic wastelands. The territory of Canada had been populated by aboriginal people, most notably the Inuit, for millennia. The first known European colony in Canada was established by the Vikings around 1000 AD; yet, their settlements did not survive for long. The French explorer Samuel de Champlain established the first permanent settlement at Port Royal in 1605, followed by Quebec City in 1608. Canada was formed in 1867 as a federal dominion of four provinces. 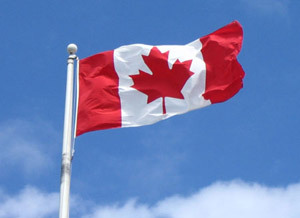 Over the years, the country gained increasing autonomy from Great Britain, culminating in the Canada Act (1982), which made the country legally independent from the British Parliament. Today, Canada is a federation of ten provinces and three territories, which is both a parliamentary democracy and a constitutional monarchy, with Her Majesty Queen Elizabeth II as the head of state. The country's capital is Ottawa, while the largest city is Toronto, followed by Montreal and Vancouver. The majority of the population is concentrated in the southern part of the country, along the border with the United States, where the climate is more favorable. Canada is a bilingual, English/French speaking country: English is the mother tongue of 59.7 percent of the population, and French of 23.2 percent. About 18 percent of the nationals are fluent in both languages. Inuktikut is the majority language in the territory of Nunavut, which has a large share of aboriginal population. Although the name of the country is derived from the Iroquoian word for village (kanata), its culture is a blend of aboriginal, British and French traditions. Numerous elements of indigenous culture have become part of modern life (canoes, toboggans, snowshoes, maple syrup, tug of war, etc.). Immigration is also a major influence, contributing to the country�s adoption of multicultural policies and religious pluralism. Canada is among the world's wealthiest nations. The economy is dominated by the service industry, which provides employment for more than three quarters of the workforce. The country is the largest foreign energy supplier in the United States and exports close to 80 percent of its produce to its neighbor. USA is the key investor in the Canadian economy, with investments targeted at the petroleum, chemical, mining, smelting, and machinery production. Other major import partners are China and Mexico. Main imports in the country are machinery and equipment, motor vehicle and parts, durable consumer products, and crude oil. As of 2009, the external debt of the country equaled $833.8 billion. Canada possesses a vast wealth of natural resources: oil, natural gas, zinc, uranium, lumber. The Canadian Prairies are among the world�s most significant producers of wheat and other grains, making the country one of the largest exporters of agricultural goods. The science & technology sector is well-developed and the country has had eighteen Nobel laureates to date, in the fields of physics, chemistry and medicine. Canada's per-capita immigration rate is the highest in the world, with more than 30 ethnic groups represented. This immigration process is fostered by the country�s broad immigration policy and high standard of life. Recently, the country has introduced liberal social policies with regard to marijuana and gay marriages. Medical marijuana was legalized for use by terminally and chronically ill patients in 2001. Gay marriages were legalized in 2005, along with Belgium, Spain, and the Netherlands.